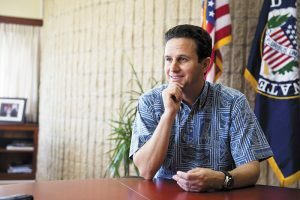 Senator Schatz during interview in his office. “IT’S SCHATZ,” heralded Honolulu Star-Advertiser Aug. 16, 2014. The words blazoned on the front page declared a decisive win for candidate Brian Schatz, Hawaii’s senior U.S. senator. Voters today still might be wondering about the “kid” who went from community causes to state leadership, then was suddenly ushered to the U.S. Senate, where revered Daniel K. Inouye prevailed for half a century. Schatz (pronounced “shots”) was 40 years old, plucked from relative obscurity — the lieutenant governor’s office — when he was appointed by former Gov. Neil Abercrombie to succeed Inouye, who died in 2012. His public service tracks include being lieutenant governor (2010-2012), chairman of Hawaii Democratic Party (2008-2010), CEO of Helping Hands Hawaii (2002-2010) and state House representative (1998-2006). Schatz is one of the youngest U.S. senators at 43 today, with the average age of his colleagues 61. As he returned recently for a holiday break, we chatted with the Punahou ’90 grad, who took an ordinary commercial flight home, bypassing a luxe ride on Air Force One with another Punahou alum named Barack Obama. But evidently Schatz doesn’t need Air Force One to fly high in government. He personifies Hawaii’s new generation of leadership in Washington, D.C.
During freezing winters and the rest of the year, he is part of Team Hawaii, comprised of fellow Democrats U.S. Sen. Mazie Hirono and U.S. Reps. Tulsi Gabbard and Mark Takai. All are relatively new faces at the federal level, succeeding experienced veterans such as Inouye, U.S. Sen. Dan Akaka, and former U.S. Rep. Colleen Hanabusa, whom Schatz defeated in the 2014 Democratic primary. Within hours of being appointed in 2012, Schatz and his family were in 30-degree Washington, D.C., for what he calls “the fastest two to three hours of our lives.” Senate Majority Leader Harry Reid welcomed him and introduced Vice President Joe Biden, who administered the oath of office. Schatz arrived at a time when Congress was in a bitter fight over how to keep the nation from going over a “fiscal cliff” of budget cuts and tax hikes. “This was day one on the job,” Schatz says, recalling the critical Senate votes needed to pass the American Tax Relief Act of 2012.